Born in Eden, Wisconsin, a sleepy town of 875 people on the fringe of Lake Michigan in the heart of America’s Dairyland, Chester Floyd is the owner of Stone Point Trading Company and bowyer at RER Bows. 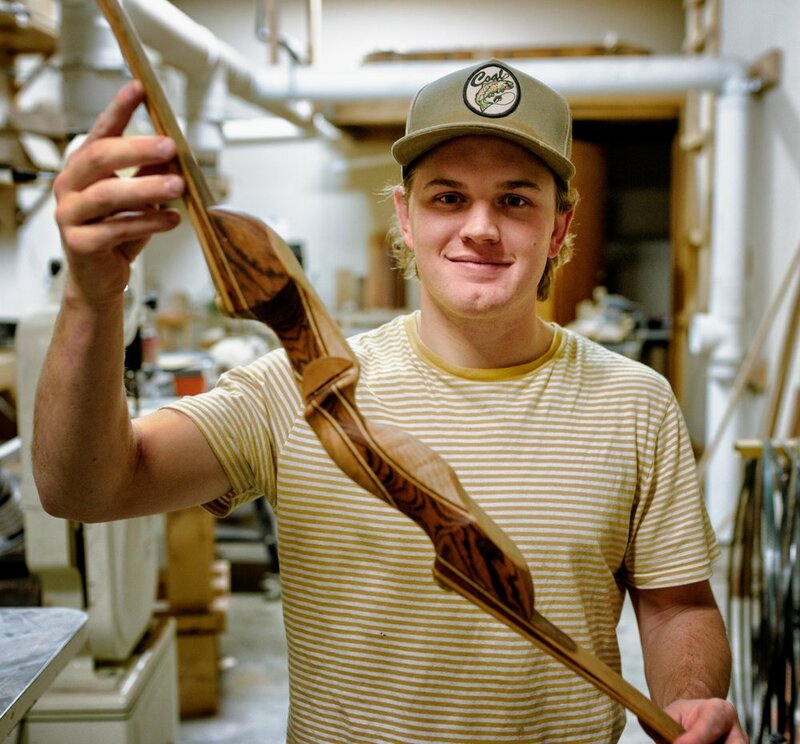 At 26 years old, he’s rising as one of the top traditional bow builders in the world. A craft often thought of as reserved for the white-haired elders of the hunting community, Chester is breathing new life into the traditional archery scene. We sat down with him over the last of his 2016 Wisconsin whitetail roasts to learn about his background in bowhunting, his renowned craftsmanship, and why he chose a business in traditional archery. How were you exposed to traditional archery? I was exposed to a traditional archery when I moved to Montana. My friend, Jim Eberhardt, was selling a longbow super cheap, so I jumped on the opportunity. I wanted to get into traditional archery because I felt like I lost my spark for bowhunting. The passion that I used to have wasn’t really there for a while, and I wanted a way to challenge myself a little more. As soon as I picked up a traditional bow I fell in love with it – I got that spark back. When I started hunting with it, my leg would start shaking when a doe walked in, and that’s something that hadn’t happened for a long time when I was shooting a compound. How did you come to own a bow shop? My brother, my parents and I went up and had a meeting with him. They had multiple offers on the business from other people that wanted to buy it. We didn't have any money, but Kevin wanted to see the business go to some young guys that had a passion for hunting and a fire in their eyes. I was so excited for this kind of opportunity. We worked out a deal, and I moved back to Wisconsin to apprentice with him that winter. He taught my brother and I everything he knew – or at least everything that he could in winter. When the apprenticeship was over we finalized the purchase, and moved the business out to Bozeman, Montana. What is it like being a young bowyer expected to build such a high-quality product? Business wise, there's a lot of pressure. Especially as a young person. I was 22 when I started. It was baptism by fire. I'm sure there’s some judgment and skepticism there. You have to keep getting better. Continually analyzing yourself, the business, and adapting. My grandfather was an amazing woodworker. He was a gardener, a farmer, and just an amazing man I really looked up to. I can remember being in his shop when he was building cabinets or chairs or whatever. I love those early memories of woodworking. I always enjoyed tinkering with stuff and being hands-on. I was never a math or a science guy, but I always liked looking at something and asking myself, “How can I build that?” I guess there might be a little bit of engineering or physics or something in there that I like doing, but I think it was more that I was hard headed and loved to work. I love craftsmanship and I love art. One Christmas, my parents got my brother and I a lathe. We started making duck calls, and I loved it. We made some calls for local Ducks Unlimited banquets and Pheasants Forever banquets, things like that. It was a natural thing for me, and it just fit me well. What are some of your favorite woods to work with? Anything pretty, really. I use woods from all over the world, but I really do like the stuff that grows right here in the USA. It's just cool. This curly maple came from Pennsylvania, this walnut came from Wisconsin, this Juniper came from Montana, this Osage is from Ohio. It's nice to have woods that are from the states that people can connect with. When I’m building risers, I like working with woods that are strong. People don't realize that the wood changes over time, and picking the right pair of woods is crucial to performance. It's not a CNC machine where I press a couple of buttons and out pops a cam and a riser. I pick the woods, I cut it out on the bandsaw, and I sand it down where I can fit the two woods together to make a nice flair or a contrast in the riser. Then I glue it together and put it in the hot box and shape it all by hand. What is your mission for RER Bows? I want to keep RER Bows small. I want to maintain the craftsmanship and the art. From a business standpoint, it’s tough to scale a business that is literally built by hand. Instead of building 2,000 bows a year and trying to pump out as many as possible, I really want to continue to grow as a bowyer and continue to elevate the quality of the bows that leave the shop. What is the most rewarding thing about building bows? There's nothing more rewarding than building a traditional bow, seeing your friends go out, and harvesting something with it. That's so exciting to me. You get to hear the stories of people that you build these bows for. There’s nothing better. I build these bows by hand, and it’s almost like a part of me gets to tag along on every hunt. What’s your specialty within bow building? I build a bow called the static tip recurve. At the end of the limb, it has a sharper hook to it. Static tips give the shooter less string pinch at full draw. The draw starts with more tension on the string, and transfers more energy to your arrows for faster, more efficient arrow flight. What advice would you give someone looking to start hunting with a traditional bow? Be ready for a challenge. You have to want the challenge. A lot of people today want quick success. You have to put the time in; you have to put the time into shooting your bow, you have to put time into tuning your arrows, and you have to put the time in to be patient, get out in the woods, and learn. You have to be a good woodsman to be a good traditional bowhunter. If I don't harvest anything with the traditional bow, I can grab a rifle and go into a spot and be successful. To get 300 yards from an animal isn’t hard to do. 30 yards is a real challenge. It's more of a rush. If you're looking for quick success and a quick reward, I would say traditional archery isn’t for you. Traditional bowhunting is about playing the long game. It takes a lifetime to become really good at it. I feel like some of the best traditional archers are guys that are in their 60s and 70s. These guys don't post their bulls or bucks on Instagram and Facebook. It's for themselves and their families. They successfully harvest elk or deer every year and it's amazing. I want to become the best I can be with a traditional bow. That’s my goal – we all have different goals. But, we're all in this for the same thing. That's the journey. That’s why we do it. It's because of the journey.